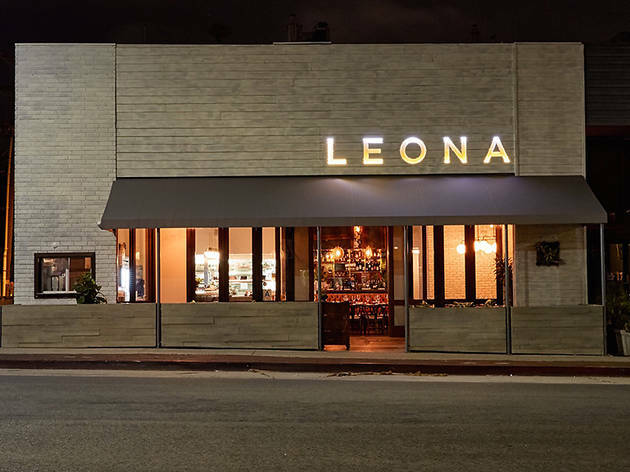 Chef Nyesha Arrington delivers creative California cuisine at Leona, but it's her brunch that really stands out at this breezy Venice restaurant. 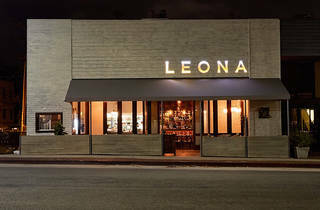 There is a lot going on at Leona, an airy Venice restaurant from Top Chef alumna Nyesha Arrington—in the space, with its curious mishmash of upscale and casual decor; in the food, which meanders between being wildly inventive and somewhat confusing; and, occasionally, with the staff (during both a dinner and brunch visit, I had upwards of three different waiters servicing our table throughout each meal). It is fascinating to read through the menu the first time—what is this “bacon and eggs” you speak of for dinner? 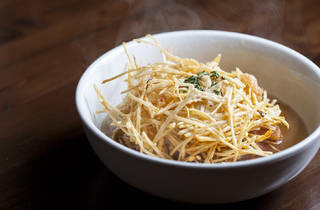 Turns out, it’s a duck egg encased in a shredded potato shell, swimming in hearty bacon broth. The playful dish is fantastic—rich, savory and fragrant—but I also wonder if it might be a better fit for brunch. 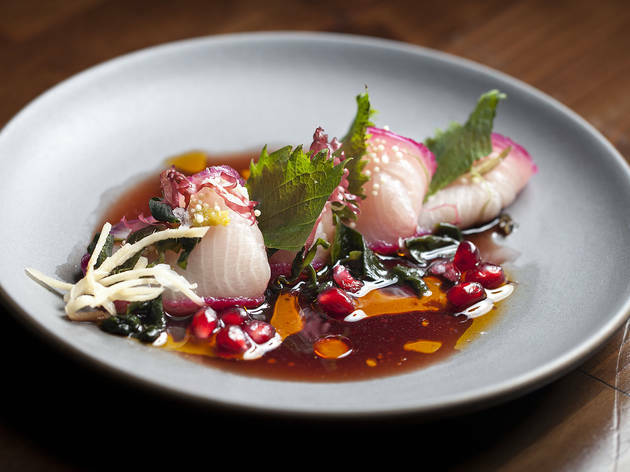 Sauces and broths pool in most dishes here: thick, silky slices of hibiscus cured hamachi soak up a tart pomegranate ponzu, and an outstanding black cod is surrounded by sweet onion jus and Japanese mustard greens. 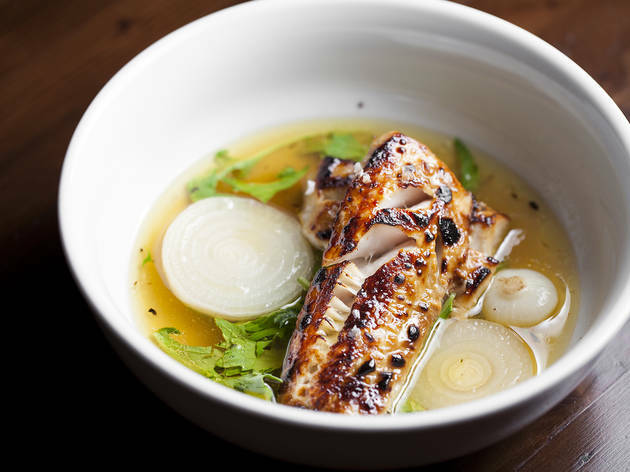 Marinated in honey and mustard for 12 hours, the fish takes on a foie gras-like quality, melting almost instantly in your mouth. Like the ‘90s alt-rock that played throughout our dinner, some of the dishes were a little too much. 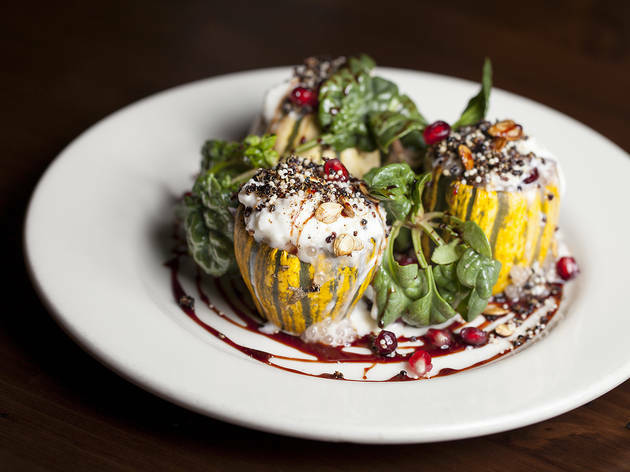 The delicata squash is a busy plate, with quinoa and tapioca risotto stuffed into a squash, topped with burrata and finished with a red wine reduction swirl. Instagram worthy? Yes. But as the sole vegetarian main course on the menu, you’d be better off loading up on less salty sides of cauliflower and broccolini. 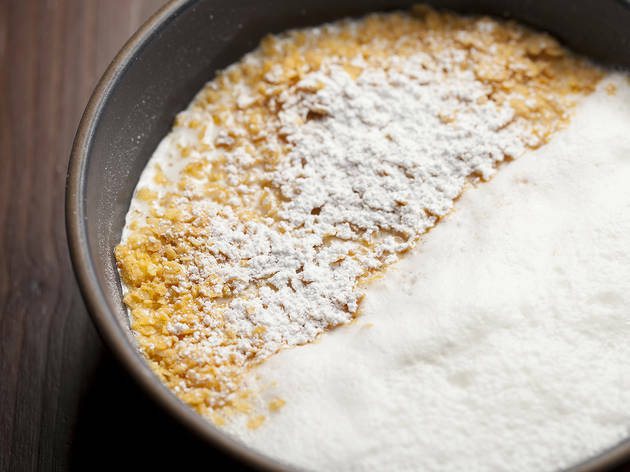 Avoid the adult frosted flakes for dessert, too, a gussied-up version of the cereal featuring condensed milk and a $10 price tag. So what is Arrington’s chief accomplishment at Leona? Brunch. If nothing else, brave the morning crowds for a stack of brown butter pancakes oozing with whipped coconut and sea salt-vanilla butter, the definitive standout on the morning menu. I was skeptical about the Korean latkes at first, but now I wish I had ordered more of them; shredded potatoes are mixed with kimchi and accompanied by a little crème fraîche to dispel some of the heat. And perhaps, if your morning hangover is a little stronger than usual, an order of the hand cut Dutch fries sprinkled with dried kale should suffice. 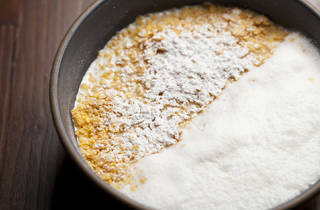 This is where Leona makes the most sense—creative comfort food on a breezy Venice morning, where a bite of coconut topped pancakes makes everything right in the world. 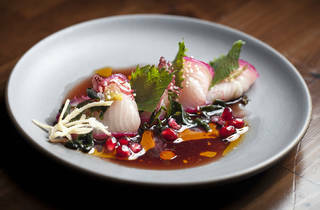 What to Eat: The hibiscus cured hamachi ($18). The “bacon and eggs” ($15). 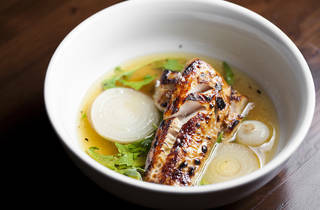 The local black cod ($29). For brunch, the brown butter pancakes ($14) and the Korean latkes ($9). What to Drink: Leona serves beer and wine, with a large selection of fantastic Central Coast varietals. On the lighter side, a glass of Cava rosé pairs swimmingly with the black cod. Where to Sit: There are certainly plenty of things to look at inside Leona’s dining room: wallpaper that evokes a jungle vibe, with leafy stalks climbing up the walls; tufted leather banquettes; mismatched light fixtures and an ornate bar area are more than enough to jumpstart conversation. It is decidedly more laid back outside, where cushions with that same wallpaper print decorate chairs on the breezy patio. Leona has definitely hit the top of my list for "Best meals of 2016" (so far). 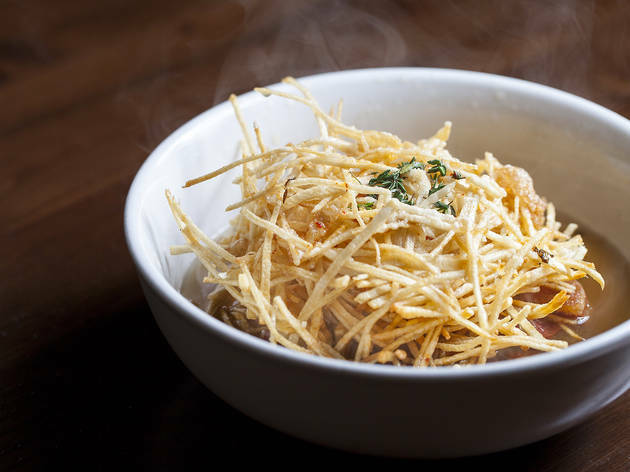 With an incredibly friendly and knowledgable staff, you can feel confident knowing if your server recommends that you get the cauliflower aligot, that she's right, and you're not going to regret it. Standout presentation for the "bacon and eggs" - maybe one of the more unique looking, but equally great tasting dishes I've ever had - and the short rib, which comes with bone marrow ready to spread on the crostini, or just on the meat itself. The lamb belly dumplings are delicious and served in a broth so addictive, we were all fighting for the last spoonful. 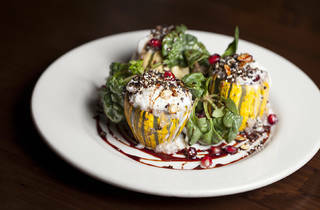 This meal does not disappoint, and the jovial environment is contagious, if not a bit loud. Such a welcome addition to the westside, a must visit for anyone in the neighborhood and worth the drive for anyone not lucky enough to live so close.